Fully refurbished HP Laserjet 6P, please also check below for the accessories we offer for the model 6P. If you have any questions feel free to Email, FAX or Call us. We also offer REPAIR service on this model of printer, if you wish to have your printer Repaired please Go Here. Wondering if this printer will fit your Needs? Recommended for printing any text documents, small to large spread sheets, small to large forms, and graphics up too full page. Replacing the LJ IIP and IIIP with some major upgrades. Will handle many of todays more complex printing jobs without a problem, even webpage printing. 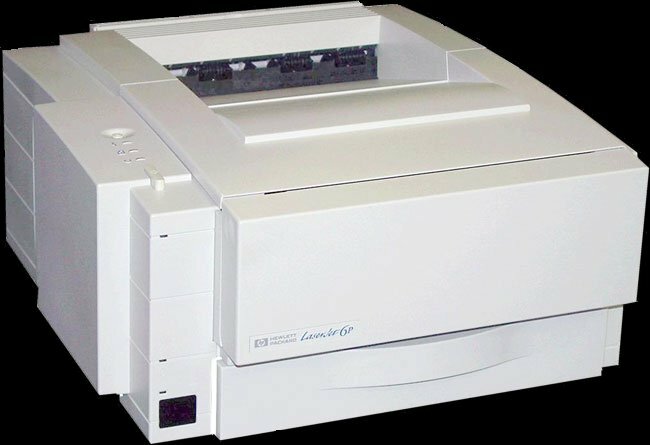 If you have a series IIP or IIIP laserjet and you have been waiting on complex jobs to print, the laserjet 6P is the perfect upgrade. A great printer for you home or office desktop. When the rear tray is folded down this printer has a very a vry straight paper path from the multipurpose tray. What this means is that it can handle extra heavy weight paper up to 43lbs or a lightweight cardstock. This printer requires very little maintenace, other then an occasional pickup assembly it has very little problem over time..
Paper sizes: Letter, A4, Legal, Executive, A3, B4, B5,.